Tippett has been hired as a senior advisor for the Tod Leiweke-run group bidding for an NHL expansion franchise and nobody is ruling out that he will eventually become the squad’s first head coach. Dave Tippett once stepped in to replace Wayne Gretzky. He played alongside and remains good friends with Mario Lemieux. And while Tippett isn’t a similar household name for casual sports fans locally, anybody in hockey knows who he is and has been curious about where the onetime NHL coach of the year would land next. The answer is here in Seattle. Tippett has been hired as a senior advisor for the Tod Leiweke-run group bidding for an NHL expansion franchise and nobody is ruling out that he will eventually become the squad’s first head coach. For now, though, Tippett will help oversee the development of all aspects of the organization, including the construction of a training facility and securing an American Hockey League affiliate franchise. Tippett, a former winger for 11 NHL seasons with Hartford, Washington, Pittsburgh and Philadelphia, will bring a hockey insider’s voice to everything, from where to locate the training facility to how to decorate the dressing rooms at a revamped KeyArena. “There are a lot of times where you need somebody with some hockey experience, whether it be infrastructure like the dressing rooms, the training facilities, or putting together the groundwork of what a skeleton hockey staff would look like,’’ Tippett said. It helps that his daughter, Nicole, is a University of Washington graduate living in Bremerton. Tippett and his wife, Wendy, make their home in Scottsdale, Ariz. but are renting in Bellevue while this new job unfolds. The gig has piqued Tippett’s interest enough to forgo a return to coaching. Until last June, he’d coached the Arizona Coyotes ever since former-part-owner Gretzky resigned his bench job in 2009 after the team sought bankruptcy protection. That first 2009-10 season, Tippett won the Jack Adams Award as the league’s top coach after the Coyotes went 50-25-7 and made their first of three straight playoff appearances. By 2011-12, Tippett had them in the conference final despite often-untenable franchise instability akin to Ken Behring’s Seahawks, Howard Schultz’s Sonics and Jeff Smulyan’s Mariners. Eventually, the ownership changes, relocation rumors — including a near-move to Seattle in July 2013 — and reduced payrolls wore Tippett down, leading to a mutual parting of ways between him and the Coyotes last summer. 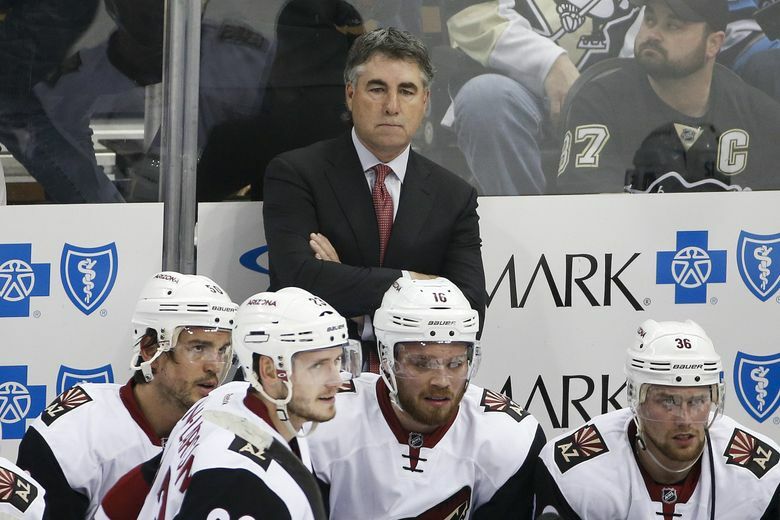 Nobody expected Tippett to stay unemployed long: He’d nailed the Coyotes job only months after the end of his previous stint coaching the Dallas Stars for six seasons. But Tippett soon found he liked working on his golf game and taking trips to Hawaii with his wife, who commented on how much more relaxed he seemed. Though he wanted hockey work — and dabbled in occasional consulting with teams — he wasn’t rushing back behind the bench. Then, Tim Leiweke, CEO of the Oak View Group managing KeyArena’s renovation and older brother to Seattle NHL group president Tod, phoned Tippett with this new proposal. And as the Seattle expansion franchise won’t be awarded before September, no general manager is getting hired yet and thus no decision can be made on a coach. “We’ll see, I’m not ruling it out,’’ Tippett said on a coaching future. “It would have to be the right situation. Tim Leiweke was a relatively new president of the Los Angeles Kings in 1999 when Tippett became an assistant coach there. Many already suspected Tippett would someday be a head coach. As a player, the Saskatchewan native captained the University of North Dakota to a Frozen Four championship his freshman year. Two years later, he captained Team Canada at the 1984 Winter Olympics in Sarajevo before his NHL career. Tippett’s two best shots at a Stanley Cup as a player both ended in Game 7 overtimes in the quarterfinals, his 1985-86 Hartford Whalers losing to eventual-champion Montreal while his Lemieux-led 1992-93 Penguins team got upset by the New York Islanders in a bid for a Cup three-peat. That Penguins team Tippett joined that season remains the closest to an NHL dynasty since the 1980s. And his Whalers squad spawned a coaching tree that includes Chicago Blackhawks head coach Joel Quenneville and assistant Kevin Dineen, former Atlanta Thrashers head coach John Anderson and a flurry of assistants elsewhere such as Dean Evason, Brad Shaw, Ulf Samuelsson, Steve Weeks and Doug Jarvis. Ron Francis, captain of that Whalers team, became a longtime Carolina Hurricanes GM. So, Tippett knows some hockey builders. He’s a builder as well, doing home renovations in the 1980s and now refurbishing old motorcycles as a hobby. But this Seattle job represents building of a different kind; one Tippett tasted in the mid-1990s launching the expansion Houston Aeros of the International Hockey League as an assistant, then head coach and later GM of what became a championship team. “First and foremost, operationally, you have to set the culture of the organization,’’ he said. “There are a lot of key things, like where the infrastructure of the team is going to be and figuring out the market. But the ability to define the culture of a team that can really grow and prosper, that’s first and foremost. And for the time being, where that culture is concerned, adding Tippett will certainly help the future team’s reputation around the game.